I am so excited to finally be typing my very first post! I am brimming over with things I want to share. It's winter here in Arizona. 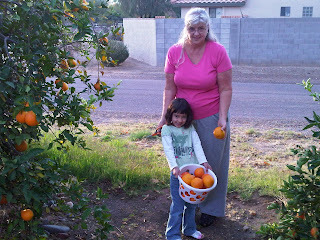 We are having a warm spell, temperatures are in the mid 70's F. That's 23.3 C. Our citrus orchard is full of sweet fruit! My favorite combination for juice this time of year is half tangerine and half tangelo. The juice is so flavorful and has a bit of a kick! This fruit is also the easiest to squeeze and has a shorter life on the tree so I try to use them up first before they begin falling off. ABC News had a very disturbing article on how our "fresh from the orchard" orange juice is actually made. After you read this article, my suggestion would be, if you live in an area where you can grow your own citrus, put in a couple of trees. They come in standard, semi-dwarf, and dwarf to meet the needs of most size yards or apartment patios. You can also buy citrus and squeeze your own. Be sure to take advantage of locally grown fruit if you live in a temperate climate. Most citrus tree owners have more fruit on their trees than they can possible use. Ask if you can purchase their extra fruit. It's always best to mix your oranges to get a richer flavor, i.e. tangerines with tangelos, Valencia juicing orange with a sweet navel orange or an Arizona sweet. 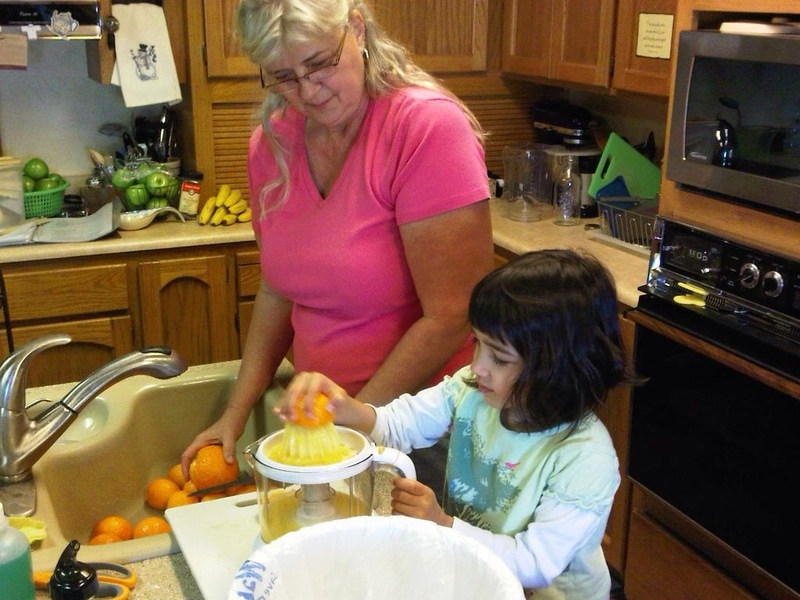 Last May I began feverishly juicing my oranges and grapefruit. The idea was to freeze the extra juice and have enough to last us through the end of November. The problem was the quality of taste was lacking. The juice tasted watered down. This year I thought, "Why not do an extra quart of juice every time I juice?". The quality of the juice will be at its peak and I won't break a sweat, and I can mix my fruit for a richer taste! To get started you don't need to buy an expensive juicer. When my juicer of 6 years became cracked and started turning black, I opted for a Black & Decker juicer from my local grocery store for under $20. I love the easy way I can adjust it for more or less pulp and the juice container holds a full quart. If we are what we eat . . . maybe we should actually know what's in our food? Just a thought. Happy juicing! Will and the Pocket Gophers . . .Happy Monday!! !